Bits and pieces of the author’s life are sprinkled in every book they write. Often the ‘story within the story’ continues even after the book is finished and in the hands of readers. 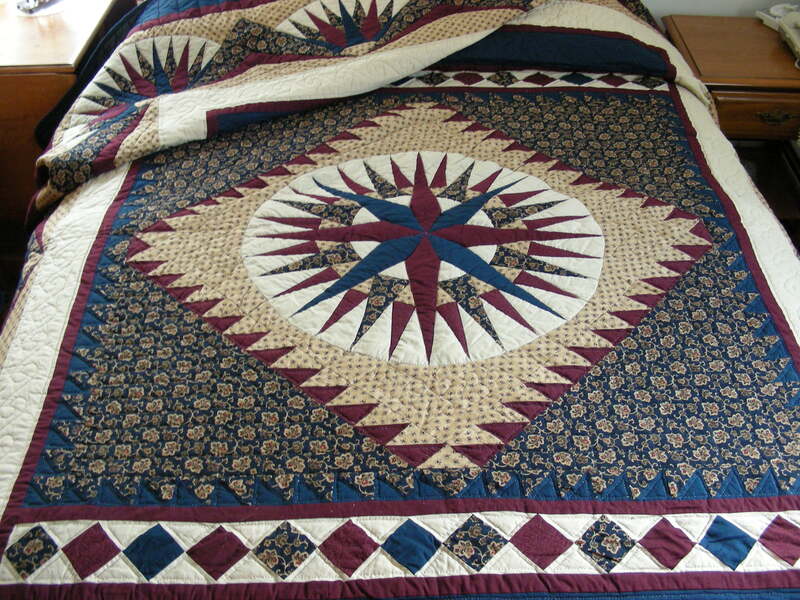 In Out Of The Wilderness (SeaMount Series, Book 1), the inspiration for Sophie’s Mariner’s Compass quilt is the Amish Mariner’s Compass quilt Old Roady bought for me in Lancaster, PA. In the novel, this quilt was a gift to Sophie from her mother. Sophie’s home is also a piece of my life. It’s modeled after my sister’s house. I loved her home. Beautifully decorated and always so welcoming. When she and her husband sold it to follow God’s call into ministry, I was so sad. In my story, Sophie needed a house, I immediately though of my sister’s home. I didn’t tell her what I had done. Her tearful surprise was just what I’d hoped for. (I love happy tears! 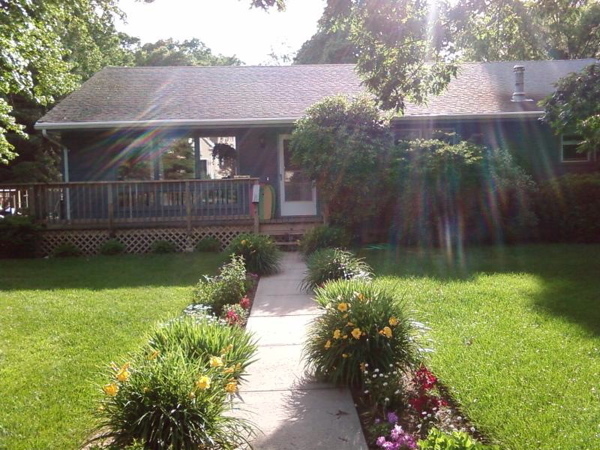 )When she moved into this home, she was a widow (like Sophie). She raised two beautiful daughters here which made it easy for me to picture Sophie’s girls on the tire swing in the front yard and running through the house. The threads of moms, daughters and quilts weave together continuing the story off the page. My sister’s eldest daughter just gave birth to a beautiful little girl, Fallyn Aurora. 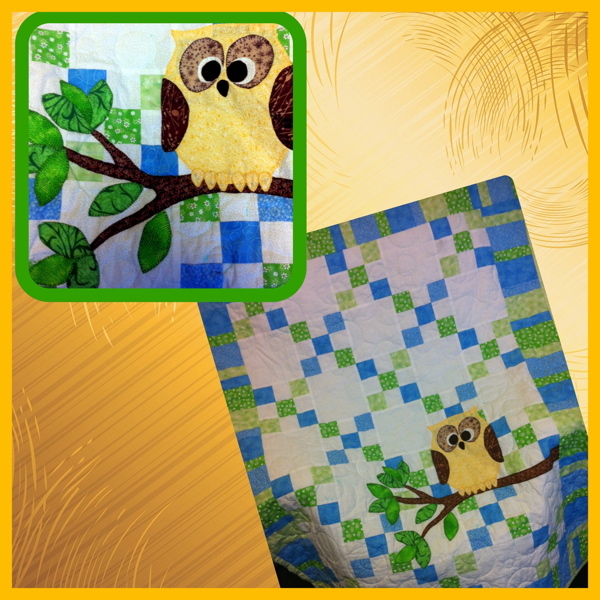 This is the adorable Owl Quilt (with a close up of the owl) my sister made for her first grandchild. The love that was fostered in that gray ranch house wraps around the next generation. Perhaps sometime in the future, the story will come back to the page and Sophie will be a grandmother making a quilt for a tiny grand baby. If you have read Out Of The Wilderness, which of Sophie’s three girls would make the best match for Davie? Posted in Anita K Greene, Author, Fiber Art, Home, Novel writing, Writer and tagged Amish, Home, Love, Mariner's Compass Quilt, mothers and daughters, Out of The Wilderness, SeaMount Series. Bookmark the permalink.